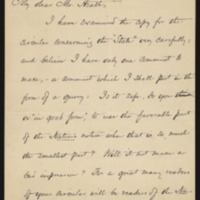 Woodrow Wilson writes to Daniel Heath concerning a circular regarding the “State.” He also asks about book sales. I have examined the copy for the circular concerning the “State” very carefully; and believe I have only one comment to make,—a comment which I shall put in the form of a query: Is it safe, do you think, or “in good form,” to use the favorable part of the Nation's notice when that is so much the smallest part? Will it not make a bad impression? For a good many readers of your circular will be readers of the Nation also. Will you not be kind enough to send me a copy of your last impression of “The State,” for my own use? I have none but the first impression, with none of the errors corrected. What is the sale of the book now? Has the list of institutions using it increased since this college year opened? I should be glad to know all you can tell me about it. Wilson, Woodrow, 1856-1924, “Woodrow Wilson to Daniel C. Heath,” 1890 November 4, WWP20438, University of Virginia Woodrow Wilson Letters, Woodrow Wilson Presidential Library & Museum, Staunton, Virginia.